The Fourier coefficients of Eisenstein series are quite simple, since they are derived from Dirichlet L-functions. 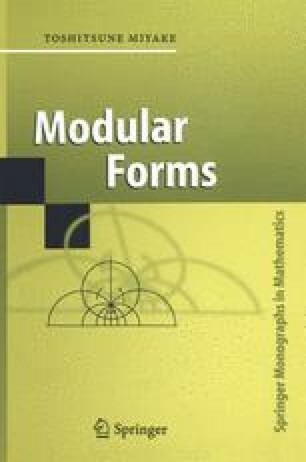 To the contrary, the Fourier coefficients of cusp forms, or equivalently the eigen values of Hecke operators are quite mysterious and play important roles in applications of modular forms to number theory (for example, see [Shimura 4] and [Shimura 6]). To obtain eigen values of Hecke operators T(n) operating on ℒ k(N, χ), we have only to calculate the traces tr (T(m)) of T(m) on ℒ k(N, χ) for finitely many m’s (see the end of this chapter).